One of the previous attractions of taking on major renewable energy projects such as solar panels was the Government’s Feed in Tariff or FiT. This essentially meant that the electricity produced by your solar panel system was paid for by the government to help offset the cost of buying the system over 20 years. It put installations like solar panels into the category of a long term investment that could, under certain conditions, yield a decent profit as well as providing a means of producing clean and cheaper electricity. Large companies such as British Gas and Scottish Power are, by law, compelled to provide Feed in Tariffs for any household or business that produces excess electricity by means of such technologies as solar power. However, smaller companies are not forced to administer the scheme and it is worth asking the question if you get your energy from anywhere outside of the big six. 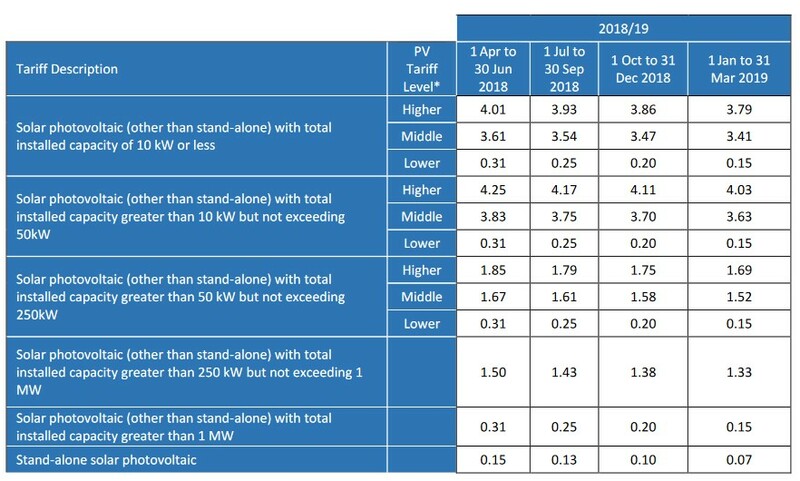 One of the biggest changes to solar in recent years were the changes to the FiT which has now ended. Having said that, those installing solar panels can still achieve reasonable savings over the lifetime of their array as electricity charges will continually rise and changes to legislation will allow energy firms to bid for the price they will pay you for the electricity you sell back to the grid.. This scheme has ENDED – Below information is for historical reference only! Under this scheme, if you had solar panels installed, both the equipment and the installer needed to be certified under the Microgeneration Certification Scheme (MCS). You would then be eligible for FiT based on your home’s Energy Performance Certificate (EPC). You could not qualify for the Feed in Tariff if you completed a DIY installation. Note that hydroelectric and anaerobic technologies have a different qualification standard and you will need to go through what is known as the ROO-FiT process. You can find certified installers of renewable technology on our hub database. How Did the FiT work? Basically, if you had a solar panel installation, you will be creating your own electricity. This was bought by the energy company who will pay you for each unit that you generate. They will also pay you an export tariff for any surplus electricity you created. The Feed in Tariff is the total amount that the energy company pays you and would have varied depending upon the size and efficiency of your installation. How Long Will the Feed in Tariff Last? The good news was that the Feed in Tariffs for solar panels, wind turbines, mCHP and hydro were guaranteed for 20 years. This means that, if you could afford the upfront costs, going for one of the eligible renewable technologies could have presented a decent investment over time, whilst also ensuring that you were reducing your energy bills and contributing to a cleaner environment. Figures were obtained from the Energy Saving Trust solar energy calculator. Will I Benefit from a Feed in Tariff? This would have depended on the size and production of your array. With solar panels, the smaller your installation size the less you are going to produce. It’s not just the panels themselves that make the difference. If you have an energy inefficient house it will affect your Energy Performance Certificate. To qualify for the D rating which is the minimum for having the high rate tariff, you may need to spend more money on insulating your home and making sure it is energy efficient. With this in mind, before you select any renewable technology and opt into the FiT, we advise that you deal with the problems of loft and wall insulation first, as well as the energy efficiency of your various appliances. As installation prices drop and energy prices rise, your pay-back-period will change for the better as long as digression doesn’t offset the changes at the time of purchase. Keep an eye on digression, FiT rates are dropping fast (FIT has now ended). Before you sign up for a FiT with a particular energy company read the contract carefully and query anything you don’t understand. You will need to remember to submit meter readings at the right time – no meter reading means you don’t get paid or paid on time. You can switch your energy supplier and your FiT licensee – make sure that if you are moving to a smaller company that they actually offer that service. The FiT for domestic homes is tax free. For businesses you are liable for tax. There’s no doubt that the Feed in Tariff delivered a return on investment though much less towards the end of the scheme. There are also other options to consider such as the possible Green Deal Finance relaunch that may help with installation costs. If you think you would like to produce your own electricity then you need to take the right advice. With that in mind you can call us on 01392 693900 or search our database of certified installers who can plan your solar or other renewable installation and advise on the best choices to make. We are interested in the installation of ground solar panel arrays for generation of 36,000kWp of electricity per year. This due to the fact we have just installed a ground source heating system which has a 3 phase electric supply. It uses about 100kWp daily (100 units in the meter/day). Would you kind enough to advise us which solar panels & system we should use? At this time we are in the process of applying for the planning permission. We have plenty of space for this.